While highly skilled at training and riding horses, we cannot ignore the human aspect of John's training program: He possesses the rare abilities of a true teacher: instruction tooled to the specific needs of each rider no matter their skillset; able to teach his students clearly and concisely, sharing his vast knowledge to the growth, betterment and success of both horse and rider. It's not just horses in training at John Swales Performance Horses. Some owners desire to show their own horse and come for lessons to assist with reining, cow work skills and schooling methods. John is proud to have a wonderful group of non-pros who come ride and take lessons; seeing students progress is very rewarding and a large part of our training operation. From beginners to top level competitors, John is happy to assist you and your horse with riding and showing skills. John Swales Performance Horses is dedicated to a training program which produces high quality working cow horses and cutting horses. From futurity colts to bridle horses, we strive to achieve top performance of horse and rider, with the ultimate goal of success in the show pen. John works a cutting horse prospect. 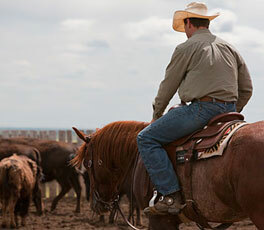 John Swales Performance Horses focuses on working cow horse and cutting horses. The first, and biggest, aged event is the fall futurities. John likes to start the 2 year old prospects himself (if possible) to gently introduce them to a cow and assess their skill potential and trainability. This time is used to slowly start setting up the basic manoeuvres and become comfortable with John, build trust and security through positive feedback and guidance. After the initial meeting, and depending on age and skill level, the young prospects may have a few months off to relax and focus on growing strong and learning how to move freely and just be a horse. As they mature, training continues and slowly more is asked of the horse with focus on achieving isolated body movements required to ensure the horse is well broke. At the same time these prospects will learn to read a cow, stop and turn with a cow. From here on in the training gradually becomes more intense asking more and more from the horse. As long as skills are progressing and the horse is displaying the essential components of a cow horse and/or a cutter (i.e. strong stops, cowy, willingness to learn) the training will continue. If the prospect stops progressing, the plan is re-evaluated with the owner. After the futurity show in the fall John likes to give the horses another short rest before progressing them towards their four year old hackamore year. At this point it is important to always have the veterinarian come and check the horse's teeth as required by natural development and growth. The four and five year old years gear up for the Derby and Hackamore shows; and John starts to introduce the bridle in their fifth year. They only show in a bridle in their sixth year and beyond. At this point some of the most exciting and sought out titles can be competed for, such as Canada's Greatest Horseman and Worlds Greatest Horseman, which are all-round competitions including herd work (cutting), reining, fence work and steer stopping (roping). Depending on the horse's talents and trainability, some are candidates for the Open competition and some may be more suited for Non-pro competition. Some other horses may just learn at a slower pace and will not be ready for the show pen until their four year old year. It is very important to discuss your goals early and evaluate them often. We encourage owners to book appointments to come and watch their horse's progress through out the program. John feels it is integral to involve medical experts along the way to ensure optimal soundness and health as these horses are specialized equine athletes and require the best nutrition and preventative care possible. For more details regarding our training philosophy, costs or other program details, please feel free to contact John directly. This program has been very successful for John and the talented horses he has had the privilege to ride. "It's been an unbelievable year. I'm a relative new 'kid on the block' as an owner. I have always gone to the Canadian Supreme in Red Deer... Do you know the feeling to see your horse and rider's name up in the lights!! I have to thank John and Deanne for the successful year. John for the care and training, Deanne for the coaching of me on the side line. John and Max are a perfect team -- they like each other and are like each other: quiet and intense. Thank you John & Deanne for making a dream come true." "Our experience with John Swales Performance Horses is second to none. John is committed to get the best out of the horses he rides. He was able to take our stallion Nic O Lena Badger to a Canadian Championship as well as a top 10 World Finalist in a few short months. We truly appreciate the dedication and excellent care that was given to our horses. We are thoroughly pleased with our experience, and highly recommend John." The Swales family has strong roots in the cattle and horse industries, from cow-calf operations to stabling horses to breaking colts to professional show jumping. 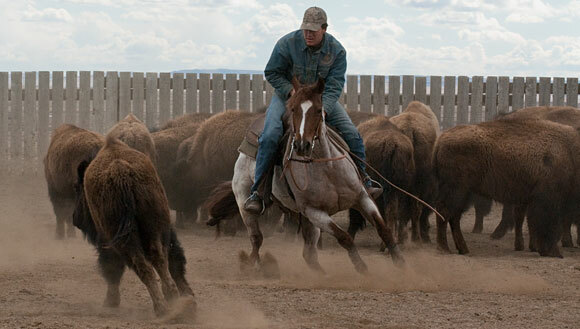 John was lucky enough to grow up in the midst of the horse profession and himself has ridden jumping horses as a child; competed in cutting, calf roping, steer wrestling, team roping and working cow horse since a young age. After high school, John focused on furthering his training skills and knowledge by working with one of the best in the industry, Les Timmons. In 1998, John began his own training endeavours at his family's home. John has always taken time to learn from many of his mentors in the cutting and cow horse world, attending clinics with world renowned trainers across North America.